Your little Girl will feel like the Princess she is in this Gorgeous Pink and Purple Castle Combo. Great for any Princess themed Party. 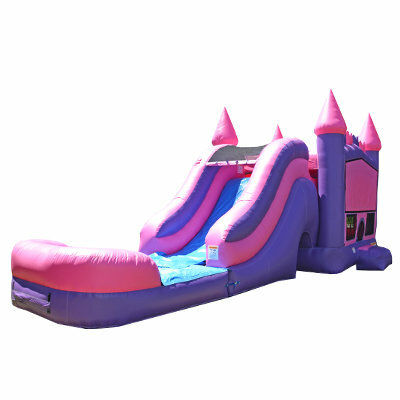 The Princess Titan dry Combo Unit features an 8 ft tall titan slide along with climbing, jumping, sliding, basketball hoop, obstacle poles and tunnel. Out front there's an inflatable safety ramp to protect excited kids as they scramble to get inside, the vinyl is fire resistant for your child's safety and all around there are large netted vented windows that keep things cool inside for the kids, while allowing parents to keep a watchful eye on all activities.